I am not sure if this the right section of the forum, but here we go. 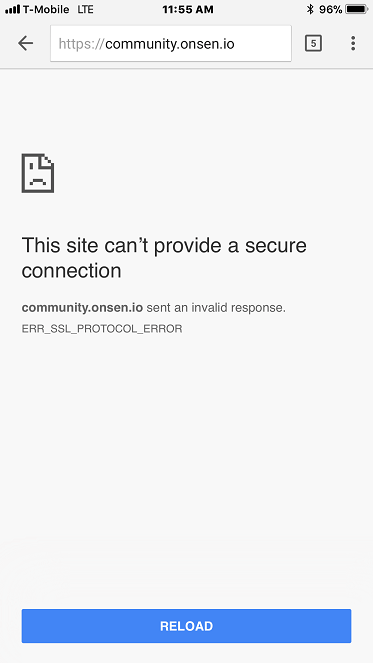 In the USA, while on the road, I cannot reach https://community.onsen.io over T-Mobile LTE celluar network either using Safari or Chrome mobile browsers. 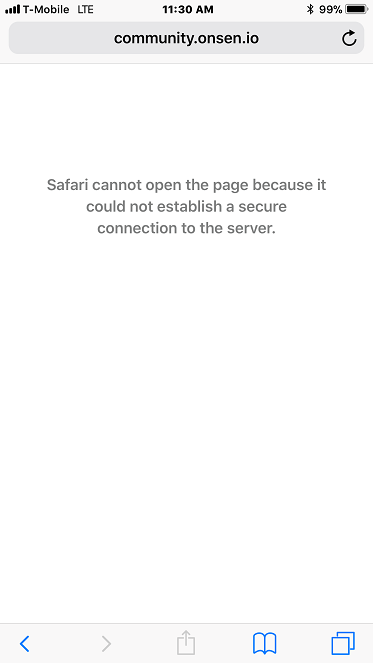 When using an iPhone over T-Mobile LTE cellular network which I am mainly using, I cannot reach the website, however on any other wifi WIFI it loads fine. I contacted T-Mobile tech support and they had the same issue. This is only site I am having issues with. 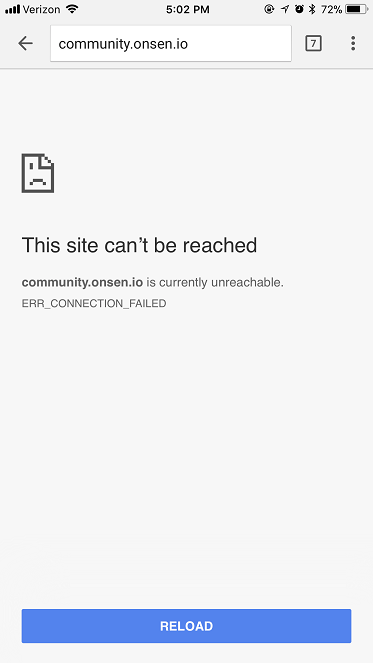 Note: I can reach https://onsen.io but not https://community.onsen.io on T-Mobile. @jamal This is the first time we’ve heard that our Community can’t be accessed from the US. Can you please try again? Is the issue still there? @khemry, yes this still an issue. This issue is only iPhones as shown in the screenshots. So it only happens on iPhone? It’s okay on Android devices? That’s weird. @khemry, yes it only happens on iPhones. A friend of mine tried it on a Samsung Galaxy 8 and it showed up fine. Could it be the SSL certificate that iPhone OS is sensitive to or an iPhone 11.x bug, currently on 11.1 ? Yes, it’s weird. I’ll contact Apple tomorrow to see if they have an answer. @khemry, I just contacted Apple tech support and they have the same issue even on A&T network. I uploaded the iPhone log files so they can investigate further. I’ll let you know once I hear from them.